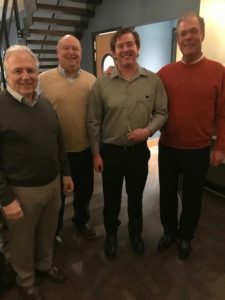 Lieutenant Michael Henderson received San Juan Island Fire and Rescue’s highest award Saturday night when the District celebrated the 2018 contributions of its members at Downriggers Restaurant. The firefighters and support members were honored for their dedicated service in 2018 at the annual awards banquet, which was attended by nearly 100 people including guests. Lt. Michael Henderson has been a District member since he was 16 years old and has responded to more than 1500 calls in his career, a record number in our District. His responsibilities are with the fleet, rope rescue, vehicle rescue, training and working as a duty officer. He is professional, courteous and is an excellent lead and support for the volunteer firefighters. Firefighters Adam Greene and Craig McConnell were both named Rookie of the Year. Firefighter Craig McConnell enthusiastically responds to a large volume of calls, often jumping into the officer seat and assuming responsibilities beyond expectation. He provides good ideas from his previous experience and education, and he is also very active in public education. Firefighter Adam Greene, also a regular participant in public education, was the perfect student, prepared and ready with questions. He always stayed after class to ensure equipment was clean and response ready, and he followed up afterwards with questions, concerns and ideas. Yasmin von Dassow earned Support Member of the Year. Yasmin has supported the District in a number of ways, working as the lead for MERT (the Major Emergency Response Team), working with logistics, and leading the department in grant writing of which the District has already successfully attained one with another still in the process. She leads in support with great care and thoughtfulness. Lt. Tom Eades received special recognition for his 30 years in the fire service with San Juan Island Fire & Rescue and with the former Town of Friday Harbor Fire Department. Lt. Eades, a career dispatcher, pilot, EMT, former Town Fire Chief and Fire Officer has been selflessly devoted to San Juan Island’s emergency services over the span of his career, while collecting microphones, securing the celebration of our local antique fire engines, and operating virtual planes, trains and ships. Bob Jarman and Michael Henderson were recognized for 15 years of service. Rex Stickle was recognized for 10 years of service. Victor Capron, Michael Long, Nathan Henderson, Bonnie Stanger and John McDowell were recognized for 5 years of service. 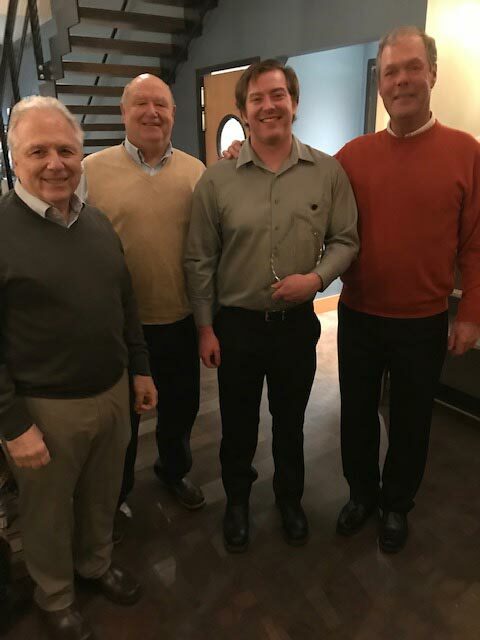 Our top responder for 2018 was Mickey von Dassow with 186 calls. 1500 calls – Lt. Michael Henderson. 1000 calls – Assist. Chief Noel Monin, Capt. Tad Lean. 750 calls – Lt. Harry See, Firefighters Tom Odegard, Mark Tompkins, Mark Wagner. 500 calls – Lt. Ken Clark, Lt. Tom Eades, Lt. Michael Hartzell, Firefighters Kyle Davies, David Howitt, Nicolas Wainwright. 250 calls – Capt. Erin Graham, Lt. Kyle Dodd, Lt. Gilbert Venegas, Firefighters Brien Sesby, Ron Stanger, Jason Wood and Mickey von Dassow. The San Juan Island Fire & Rescue would like to thank the Orcas Fire Department for providing a crew of firefighters to cover initial responses during our banquet. San Juan Island Fire & Rescue was established on October 6, 1958. The fire department covers about 55 square miles, which includes all of San Juan Island, as well as Brown and Pearl islands. For more information about the fire department, go to www.sjifire.org, view our Facebook page, San Juan Island Fire & Rescue, or phone 360-378-5334.